Oftentimes, we just need to unwind from all the stress in order to keep us sane and functioning optimally. As a matter of fact, we don’t just need it, we actually deserve it. There’s a lot of ways for people to unwind and one of them is going to resorts. 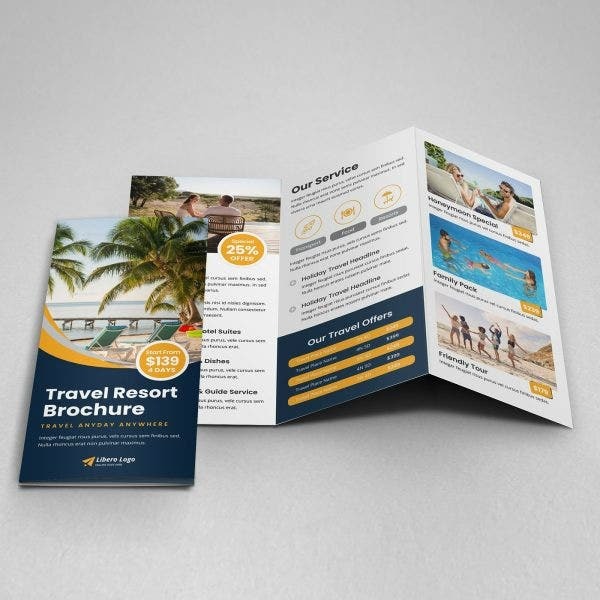 If you’re managing one, you might be interested in our resort brochure templates below. Whether you’ve tried creating your own brochures before or this is still your first time, it’s always best to keep yourself educated in terms of how brochures are really created. You may want to research for tips online or you may also refer to brochures from established businesses for inspiration. Brochures have various types and they mostly differ according to their folds. These types include but are not limited to bi-fold, tri-fold, roll fold, and gatefold brochures. But aside from just the folds, every brochure type has its own purpose which makes it even more important to choose the right one. Outlining your content means preparing what information to include and how it should be arranged on the brochure’s layout. 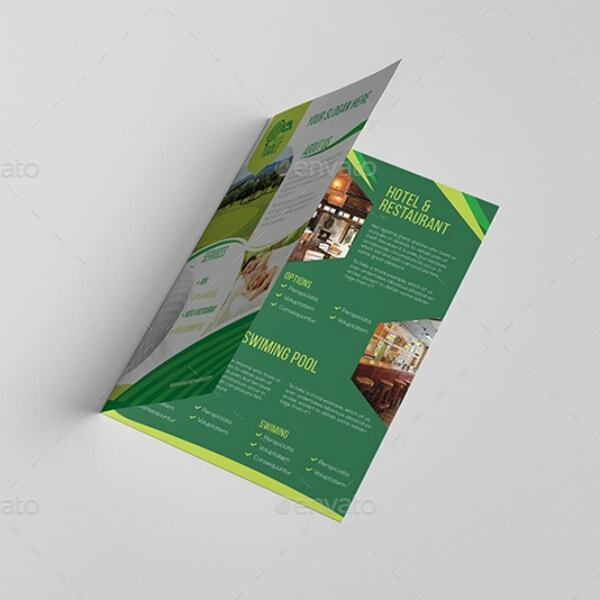 Business brochures commonly consist of the business’ name and logo, a short background, the list of services or facilities, some reviews or testimonials from past clients, and the business’ contact information. Unless you’ve already got tons of them prepared, you may need to take photos of the resort. When taking photos, make sure that they are able to capture the resorts best features and the lighting is adequate. You can take as many photos as you like, you can simply choose which ones to use during the editing phase. 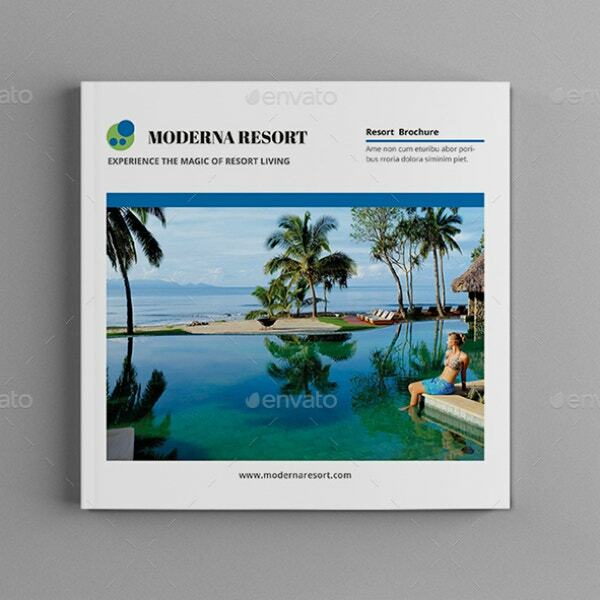 Below, we’ve got resort brochure design templates that you can download and these templates are fully editable. Simply download one and customize it according to your preferences. Add your content and the photos that you have prepared beforehand, and see if the overall look of your brochure matches the resort’s tone. 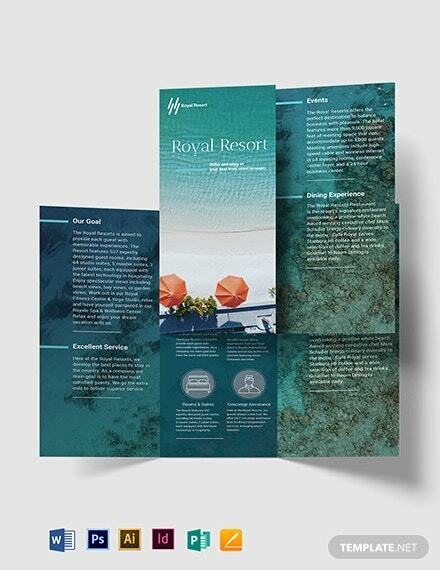 Before printing your resort brochures, check first for the content and see if there is a need to correct any error. Proofread your work from front to back, a single error can damage not only the brochure’s credibility but the business’ as well. Afterward, you can proceed to print your resort brochures. Provide readers with what they need to know about the resort and its best features, you don’t need more than that since they can always reach out to you if they wish to know more about the place. This is exactly the reason why it’s important to always include your contact details on your advertising brochures. If you’ve got a lot to say about your resort, you might need to organize your content in order for readers to easily find the information they need. 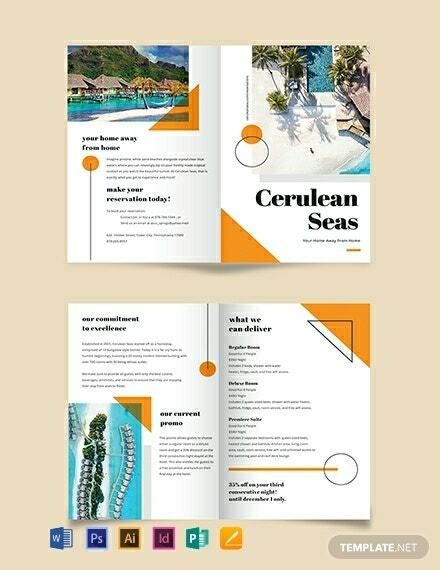 The tri-fold type will allow you to use its panels for organizing your content, you may even accompany it with a resort business card to really encourage people to get in touch with you. Brochures with impressive designs may often lead to creating a good impression of the business. 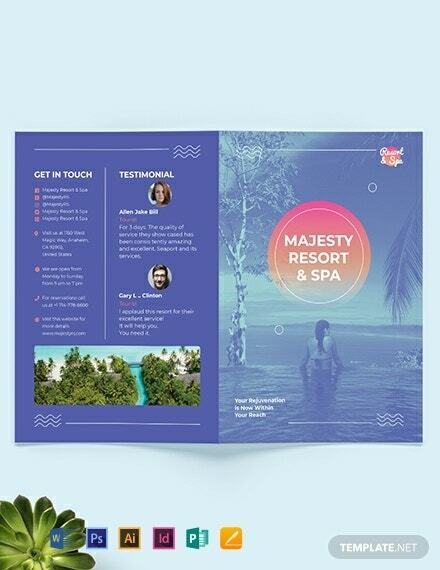 If the design of this template impressed you but you feel like you could use more panels, you can also check out our spa resort tri-fold brochure template which is basically a tri-fold version of this. It’s always best to make your brochure’s cover page as impactful as possible to get people excited without having to turn to the next page. Adding a full-page photo is a good strategy since it presents readers with a clear image of how the resort looks like, check out the template above to see how it’s done. While most modern brochures have a portrait orientation, you can always make your brochures unique by using a square shape. 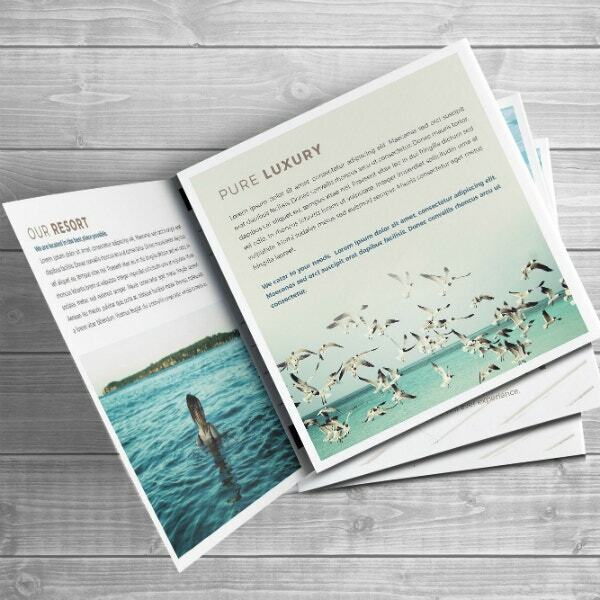 Not only will these brochures easily stand out, but it will also allow you to write more content and use larger landscape images, just make sure not to overwhelm readers with too much information. People tend to cram brochures with too much content and this makes it less readable. The use of white space will allow you to limit your content but at the same time, draw more attention towards your brochure. If you plan on sending this through the mail, we also have a resort envelope template that you can use. 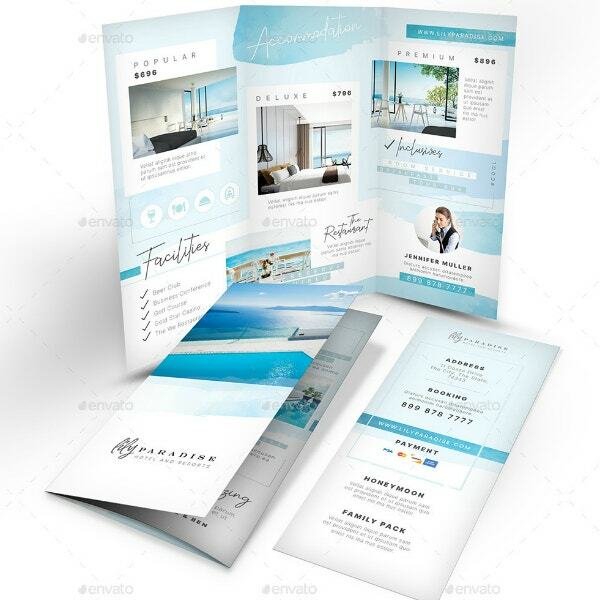 To make your brochures more valuable, you may be allowed to mention about promos or discounts. This way, guests will hold on to the brochure in order to avail of it. However, you may also be allowed to use a resort coupon or a resort voucher to keep those details separate from your brochures. If you think resorts are only those that are situated near a beach, some are also located near golf courses which are perfect for golf aficionados. Aside from just using brochures, you may also be allowed to promote the establishment using our golf resort rack card template.